French for “fake wood” (so really, the French sounds ever so much better and we should probably stick with it), the term faux bois refers to a decorating motif. 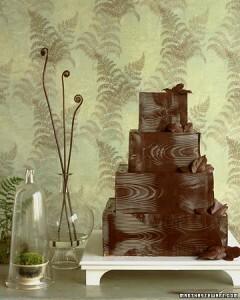 Here it’s made by pressing a wood graining tool into the shiny ganache glaze that coats the cake layers. Since the tool is applied directly to the finished glaze, this takes a steady hand for sure, but it yields a beautiful result. I think this really is a lovely option for a groom’s cake. The chocolate is traditional; the woodgrain is masculine; and the whole effect – complete with lemon leaves brushed with tempered chocolate for a garnish – is lovely and elegant. This is a stunning cake. Do you love chocolate groom’s cakes? Do you think groom’s cakes should be elegant or more playful and informal? Leave a comment below and let us know your thoughts!